Keep this in mind for the next time you have an 'open book' exam. Most of us would remember fondly the wonderful teachers who would allow us to take 'open book' tests and carry 'help notes' for exams. One such wonderful teacher, however, remembers a student who found an ingenious loophole to his 'carry a notecard' policy. "First test day of the semester and as always, I allow a 3x5 notecard. Today, a student shows up with this. 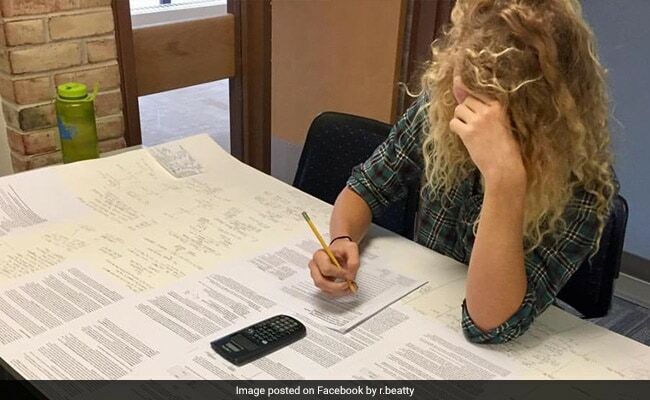 Sure enough, it is 3x5... feet," writes Reb Beatty, who teaches an accounting course at Anne Arundel Community College in Maryland, USA. That's right, her student actually walked in with a note card measuring 3 feet by 5 feet, all because his professor forgot to specify 'inches'. And yes, he was allowed to take the test too. It was a 'lesson learned for me', says Professor Beatty. Since being shared online on September 20, the post has collected over 32,000 reactions and almost 30,000 shares. Do let us know using the comments section below if you're planning on pulling this trick in your next exam.